Photo Cutline: Gloria Rincon, secretary to the CBC Board of Trustees, was awarded the Association of Community College Trustees (ACCT) Western Region Professional Board Staff Member Award at the 2013 ACCT Congress in Seattle, WA. The Coastal Bend College Board of Trustees approved the purchase of a $239,500 oil and gas simulator at their regular meeting held on Thursday, October 17. A grant from the Texas Workforce Commission’s Skills Development Fund will cover $163,694. The remainder of the balance will be funded via previous donations from Pioneer Natural Resources ($35,439) and Marathon Oil ($22,696), plus funds will be utilized from the CBC Oil & Gas Technology Program budget ($17,671). The simulator will be used to teach credit and non-credit curriculum, as well as customized and continuing education training. The state-of-the-art simulator will give students and trainees hands-on experience with operating a full size drilling, production, and work over simulator. The simulator will be installed in spring 2014 on the CBC Beeville campus. CBC Professor Kevin Behr, J.D., provided updates to the Board about the CBC Law Enforcement Program. Over 600 students each academic year enroll in a CBC criminal justice/law enforcement course at either the college or a high school via dual credit, and about 25 students each year graduate from the program itself. The program’s high quality education, outstanding reputation, and affordable tuition attract students from all over Texas. Current law enforcement student Justin Gonzalez is from Brownsville, TX, and he was recruited by Behr while still in high school. “When I first heard that CBC was at my high school, I went to the presentation just to skip my ninth period class. But after talking to Dr. Kevin Behr, I knew CBC was the right place for me. I received a CBC scholarship and a CBC dorm scholarship to help with my education, and once I graduate from CBC I want to transfer to Sam Houston State University. Eventually, I plan on attending law school. I wouldn’t be here, and I wouldn’t be successful, if it wasn’t for Dr. Behr. Go Cougars!” Gonzalez said to the Board. The CBC Law Enforcement Program curriculum voluntarily conforms to the Texas Commission on Law Enforcement Officer Standards and Education curriculum to ensure that graduates have the skills and knowledge needed as an entry level law enforcement officer, trooper or agent. The program also offers specialized training to students who desire to attain a mastery level in a specific area in which there is a recognized industry need. For more information on CBC’s Law Enforcement Program, please contact Dr. Kevin Behr at (361) 354-2338. CBC’s Annual Performance Review for the 2012-2013 academic year was presented to the Board. During the 2012-2013 academic year, the College awarded 805 degrees and certificates. This marks the fifth year in a row that CBC has seen an increase in the number of degrees and certificates awarded to students. Furthermore, all CBC Radiologic Technology and CBC Dental Hygiene program graduates passed their respective licensing exams. CBC, an Achieving the Dream Leader College, is also making great strides with students enrolled in developmental education courses—over 90-percent of students enrolled in developmental reading and English/writing courses were successful and passed to the next level. The CBC administration, faculty, and staff continue to research and implement new strategies and practices that will help improve student success. The Board authorized for Lovvorn & Kieschnick, LLP to act as auditors for Coastal Bend College for the fiscal year ending August 31, 2013. This marks the third fiscal year that the College has utilized Lovvorn & Kieschnick’s services. · The Southern Association of Colleges and Schools Commission on Colleges (SACSCOC) focused report was mailed in early October. The SACSCOC site visit is scheduled for November 19-21. · From October 2-5, Dr. Espinoza and several CBC trustees attended the 2013 Association of Community College Trustees (ACCT) Congress in Seattle, WA. 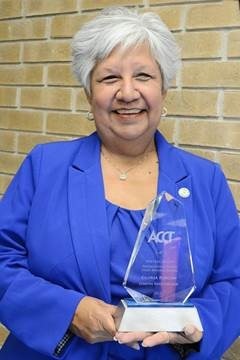 Gloria Rincon, secretary to the CBC Board of Trustees, was honored at the event with the ACCT Western Region Professional Staff Member Award. · On November 6, Dr. Espinoza and Dr. Flavius Killebrew, Texas A&M University Corpus Christi (TAMUCC) President, will sign formal articulation agreements between CBC and TAMUCC. The signing will take place at TAMUCC. At Coastal Bend College your future begins here—and now. Let us help you advance your career and education. With so many programs, there’s bound to be something perfect for you. Let us tell you how. Contact us for more information about the programs and courses offered at Coastal Bend College by calling 1-866-722-2838 ext. 2266. Or you can visit us on the web at www.coastalbend.edu. You can also find us on Facebook at www.facebook.com/coastalbendcollege and Twitter at www.twitter.com/cbcfuture.